"It is very noticeable in almost all photographers' attempts at 'landscape with figures' that the best are those in which the accessories selected for the interest they add to the scene, are inanimate objects, or at least figures unconscious of the photographer and his intention. Now and again a very natural figure study is seen, as in several of Mr. Gale's photographs, but the human element appears to be very generally too much for the methods of the ordinary photographer. 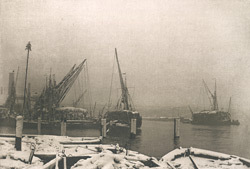 Another of Mr. Gale's happiest efforts is that entitled 'A Foggy Day on the Thames,' (a subject secured under the conditions of a heavy snowfall) in which the whole effect is true and striking."